A Shining Celebration of Community Service! Two lions facing outward from the letter "L" in royal blue and gold. It's a familiar logo -- one you've seen numerous times on town signs, restaurant counters and donation bins. Perhaps your grandfather had it sewn on a jacket or one of your parents wore a pin that featured it proudly. It's a symbol of the world's largest service club organization with over 1.35 million members in more than 45,000 clubs worldwide -- including friends, family and maybe even you! 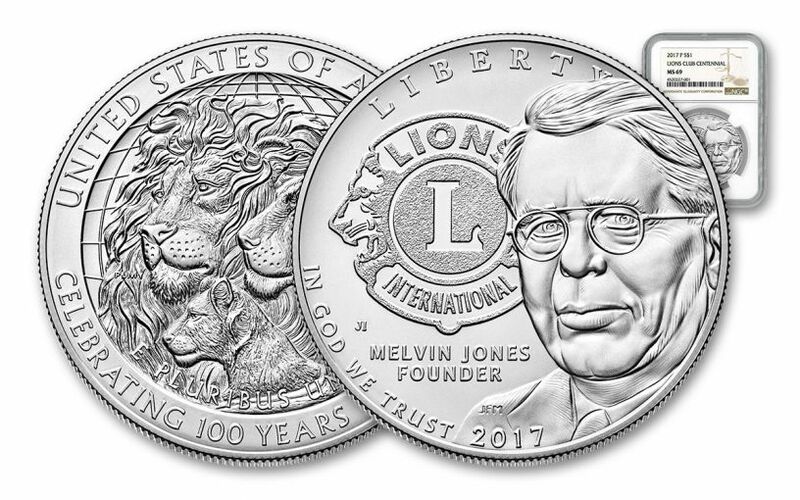 It's the Lions Club International, and the United States Mint has the perfect way to celebrate this organization's 100th anniversary! 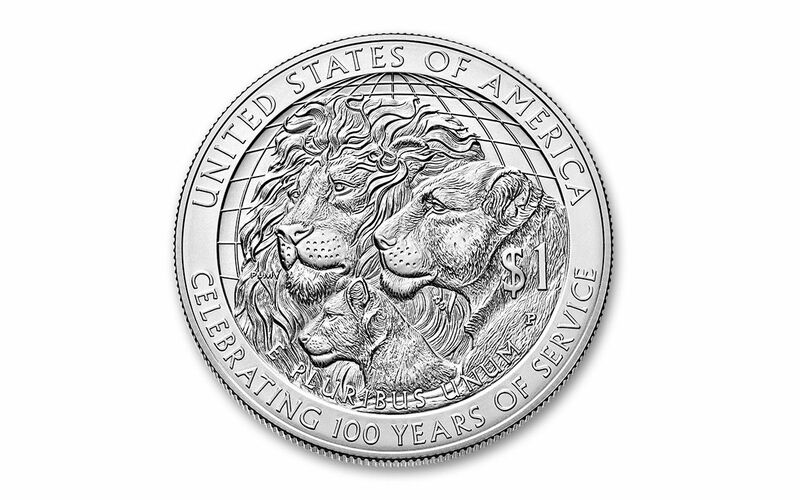 This 2017 Lions Club International Centennial Silver Dollar is the first U.S. Mint commemorative for 2017 and honors one of the few service organizations ever chosen by the program. 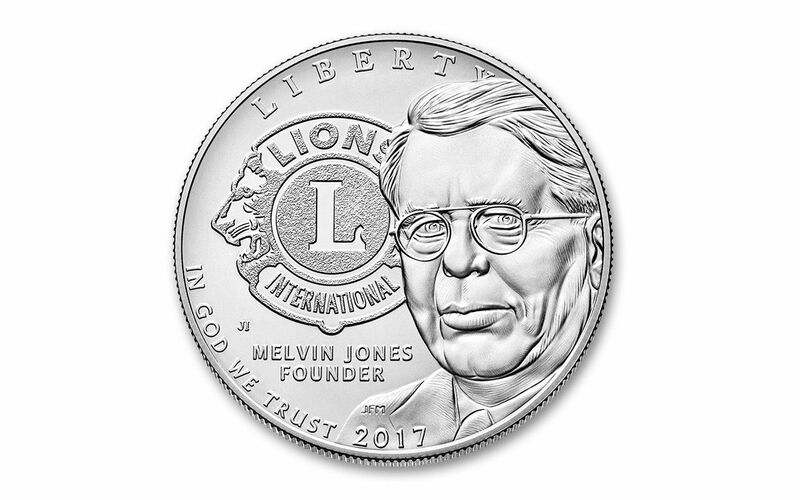 The literal heads of this legal-tender one dollar coin features the iconic Lions Club International logo along with the profile of Chicago business leader and founder Melvin Jones. Flip the coin over, and you'll find a family of lions embodying both the organization's namesake and the embodiment of fidelity which, together with courage, strength and activity, serve as the Lions Club International's guiding principles. 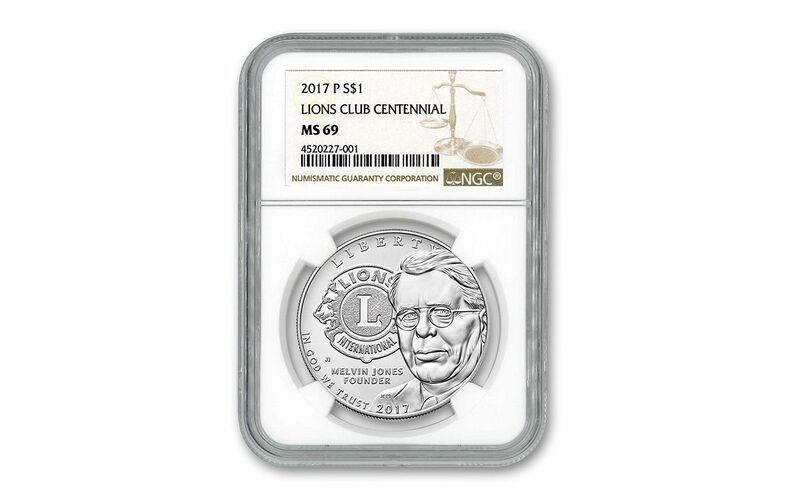 Your coin will be graded Mint State-69 (MS69) by Numismatic Guaranty Corporation (NGC), a distinction that means your almost-flawless 2017 Lions Club International Centennial Commemorative will showcase an impressive full strike and indistinguishable imperfections -- well above and beyond the quality of the vast majority of coins in the series. In fact, many collectors prefer the MS69 grade since it certifies recognized collector status for just a small premium above ungraded coins. Your commemorative will be sonically sealed in an acrylic case with white display core -- giving you the best in protection while granting clear sightlines into every beautiful detail. A portion of the original mint proceeds will go toward supporting Lions Club International's ongoing global humanitarian efforts -- preserving sight, combating disability, promoting health, serving youth and providing disaster relief. Only 400,000 of these coins, along with their proof counterparts, will be minted -- that's a limited amount to spread over more than a million members worldwide! Don't miss out on this chance to commemorate 100 years of bringing people together one community at a time. Order yours today!